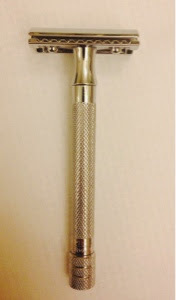 I have been making my own beauty products and trying to find the most eco ways to care for my body so i researched eco shaving and everyone said to buy a safety razor. they last forever (little waste) and the replacement blades are around $6.00 for 10. I have been using it for a week now and i really like it. Take your time with it because it is sharp and will easily cut you. I bought the Merkur razor on amazon along with a 10-pack of blades.